Start off your visit on the 15th (Wed): take in the dramatic scenery at Daiñthlen Falls. For ratings, other places to visit, traveler tips, and tourist information, use the Cherrapunjee online trip itinerary maker . New Delhi to Cherrapunjee is an approximately 6.5-hour combination of flight and taxi. You can also drive; or do a combination of train and bus. Cap off your sightseeing on the 16th (Thu) early enough to go by car to Kamrup Metropolitan District. Kamrup Metropolitan or Guwahati Metropolitan is one of the 35 districts in Assam state in north-eastern India. On the 17th (Fri), get your game on at GeT TaggED, take in the spiritual surroundings of ISKCON Guwahati, then take in the spiritual surroundings of Navagraha Temple, then contemplate in the serene atmosphere at Ugratara Temple, and finally take in the exciting artwork at The Maati Centre. For traveler tips, more things to do, reviews, and more tourist information, read Kamrup Metropolitan District trip app . Traveling by car from Cherrapunjee to Kamrup Metropolitan District takes 2.5 hours. May in Kamrup Metropolitan District sees daily highs of 38°C and lows of 26°C at night. Finish your sightseeing early on the 17th (Fri) so you can travel to Bomdila. Bomdila is the headquarters of West Kameng district in the state of Arunachal Pradesh in India. Kick off your visit on the 18th (Sat): contemplate in the serene atmosphere at Chilipam Monastery, make a trip to Apple Orchards, see the interesting displays at Craft Centre And Ethnographic Museum, then get great views at Bomdila War Memorial and View Point, and finally admire the landmark architecture of Bomdila Monastery. To find where to stay, traveler tips, other places to visit, and tourist information, go to the Bomdila road trip app . Drive from Kamrup Metropolitan District to Bomdila in 8.5 hours. Finish your sightseeing early on the 18th (Sat) to allow enough time to travel to Kohima. Kohima is the hilly capital of India's north eastern border state of Nagaland which shares its borders with Myanmar. On the 19th (Sun), pause for some serene contemplation at The Catholic Cathedral, don't miss a visit to Naga Heritage Village, then delve into the lush surroundings at Pulie Badze, and finally pause for some serene contemplation at Catholic Church. For maps, other places to visit, and tourist information, refer to the Kohima online trip itinerary planner . Drive from Bomdila to Kohima in 13.5 hours. Wrap up your sightseeing on the 19th (Sun) to allow time to drive to Imphal. Imphal is the capital city of the Indian state of Manipur. 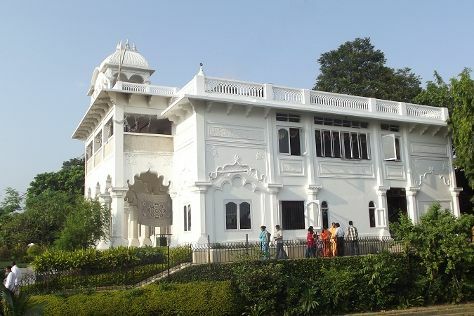 Kick off your visit on the 20th (Mon): stroll the grounds of Imphal War Cemetery, admire the masterpieces at Three Mothers Art Gallery, then contemplate in the serene atmosphere at Shri Govindjee Temple, then contemplate in the serene atmosphere at ISKCON Imphal, Sri Sri Radha Krishnacandra Temple, and finally browse the eclectic array of goods at Ima Keithel Women's Market. To see photos, maps, ratings, and more tourist information, you can read our Imphal route planner . You can drive from Kohima to Imphal in 5 hours. Wrap up your sightseeing on the 20th (Mon) to allow time to travel back home.